After! A new white bed and pintuck duvet cover (both from The Linen Chest) are balanced by airy Claire curtain sheers. It’s like sleeping in a bowl of whipped cream! Before. Could use a little help, no? If I’ve learned one thing from our renovation adventures, it’s that lighting will make or break any room. Lighting was the focus of the project: back when we started on May 24, there was no lighting in the room. None. Nada. In fact, the light switch by the door powered an outlet! (OK, it’s technically up to code, but also very, very silly!). Our goal was to add hanging pendant lights beside the bed for reading, and to install directional spot potlights around the room to add some nice background fill light. I was also desperate to continue removing all of the popcorn finish from the house. 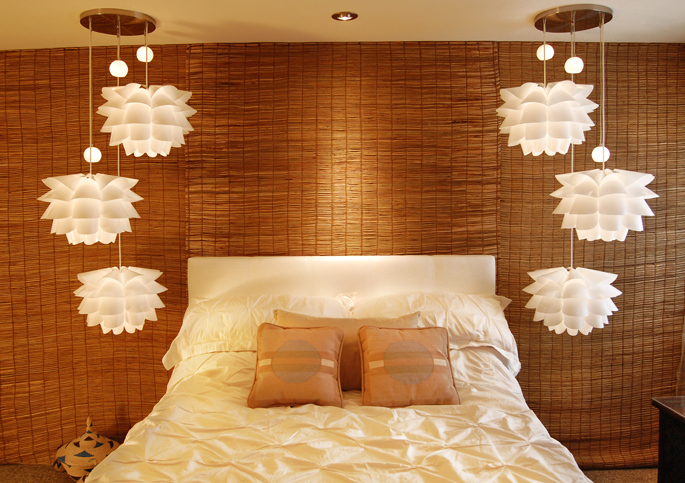 The grass matting covers the wall, but the look is leavened by large modern lamps from Ikea. It looks like flowers and unopened buds. Those who have seen our living room reno post will notice a similar take on the lighting. This was deliberate, for consistency in our shoe-box sized house: I feel small spaces seem more open when they are tied together visually. I like organic shapes and modern approaches in my lighting, and wanted to continue with that motif. I was originally drooling over a much more expensive set of fixtures, but when we started looking at the numbers, I decided that the Knappa lights from Ikea would work very well and cost about a thousand dollars less. Do you want to know the crazy clever part? My wiring genius husband Justin assembled the pendants into a separate fixture base. The Knappas were just wired together, but the smaller Minuts (also Ikea) required a transformer – and they’re all tucked away together in the brushed nickel base, which was purchased separately. You can read about our construction and wiring work here. 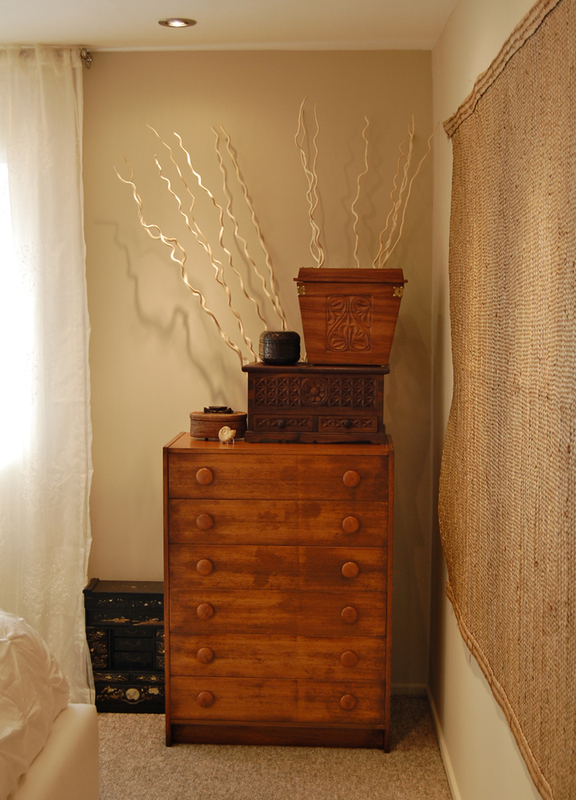 Dresser (refinished by my Mother) and hand-carved Tanzanian boxes. The little woven box is from Bali. The small black chest is a family antique from China. Credit for purchasing almost all of this goes to my fantastic Mom! The wall colour was a bit of a challenge as well. I wanted to go softer than the autumn shades downstairs, and tried a number of colours in test patches on various walls of the space. I eventually went with a green/tan/grey from CIL’s Martha Stewart line called “Sisal”, with Behr’s “Serengeti Dust” for trim and for the closet doors (I’ll be posting about those later – when they’re done!). “Sisal” is a bit of a chameleon colour – it can look reddish very easily – at least in our space, with red brick buildings outside the window. To be honest I went through a bit of a crisis of confidence, when it didn’t turn out to be as green as I thought it would be. If you’re ever considering repainting if a colour doesn’t work out, try putting the furniture in the room first – when we did that the look came together and we kept the colour. 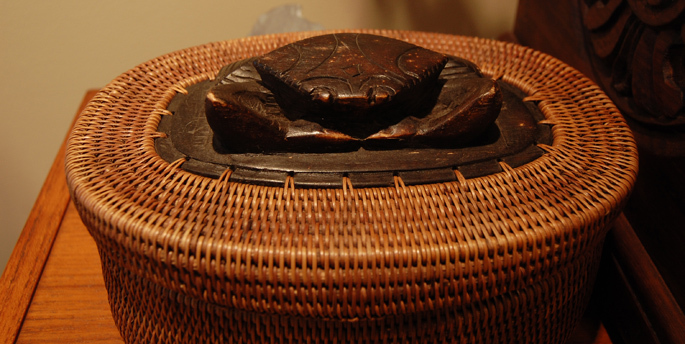 My Balinese basket with a lovely carved crab on top. This holds some favourite jewelry pieces. They say there’s always at least one unexpected surprise on every renovation project, and this was no exception! In this case Justin was touching up the (unprimed – thanks original builders) drywall near the window, and discovered that we had mould in the walls! He poked through a piece near the window and found a Lovecraftian horror caused by a leak under the window. It turned out that the window was shimmed level, but the shim had been hammered right through the caulking around the outside of the window. With every serious rain, water was wicking into the walls. Luckily we were able to remove the rotted wood and drywall, spray mold killer everywhere, and seal it back up, better than new. It did put the project back a bit, however. Just remember if you ever have a setback like this, it is always better to find the problem and fix it – the longer it is left the worse it will be! 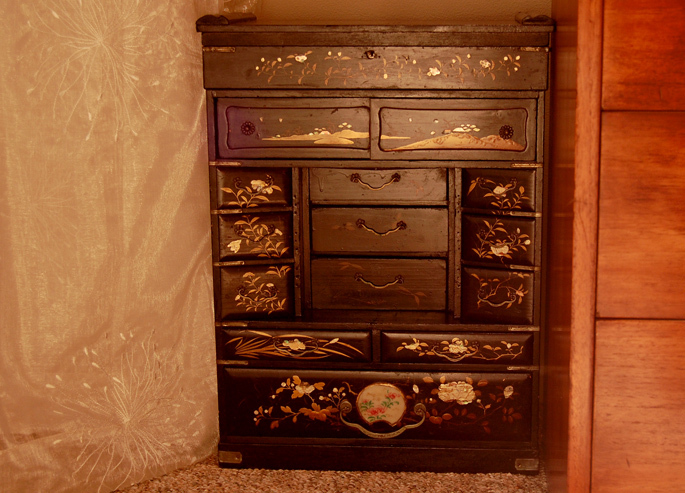 An antique Chinese chest that I use for jewelry. 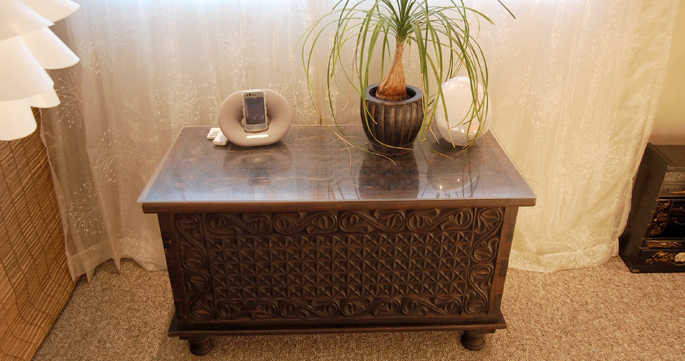 A hand-carved Tanzanian chest is used for storing off-season clothes and blankets. “Claire” curtain sheer detail. 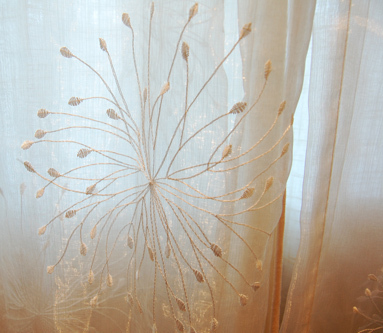 To get a dreamy effect, I put the sheers (2 layers of them) inside a linen-like outer curtain that blocks out more light when we need it. A surprising lesson from this reno project: going without a bedroom is surprisingly irritating! I knew that kitchens and bathrooms are awful, but didn’t think that the bedroom would be so bad. Wrong! Even though we moved our bed to another room, I could not get this done fast enough. I think a large part of it is being without a closet, and with most of my clothes tucked away in boxes and bags throughout the house. And I am not even a fashionista or anything! That reminds me – I have a confession: the closet is still not done! That’s why that part of the room is not in the pictures. We have the old closet bar and shelf torn out and everything is finished and painted, but the new closet shelves and bars and doors are not built yet. That will be coming up in a later post – I think you’ll like it. So, everybody, what do you think? Is there anything you would change?